To compare centration and functional optical zone (FOZ) after small incision lenticule extraction (SMILE) and femtosecond laser–assisted in situ keratomileusis (LASIK). In this prospective, randomized, single-masked, paired-eyed, clinical trial, 70 patients received SMILE in one eye and LASIK in the other eye for myopia and myopic astigmatism. FOZ was calculated using custom software on 3-month postoperative refractive power maps (Pentacam HR; Oculus Optikgeräte GmbH, Wetzlar, Germany). Programmed treatment area was defined as the total area of the programmed OZ plus the transition zone. Centration was evaluated by the linear distance between FOZ centroid and the pupil center and the corneal apex. The average preoperative spherical equivalent (−5.38 ± 1.65 vs −5.45 ± 1.61 diopters [D]), postoperative spherical equivalent (0.05 ± 0.39 vs 0.06 ± 0.39 D), uncorrected distance visual acuity (0.01 ± 0.13 vs 0.00 ± 0.08 logMAR), and corrected distance visual acuity (−0.07 ± 0.10 vs −0.07 ± 0.10 logMAR) were comparable in SMILE- and LASIK-treated eyes of the 60 patients with complete datasets (P > .419). 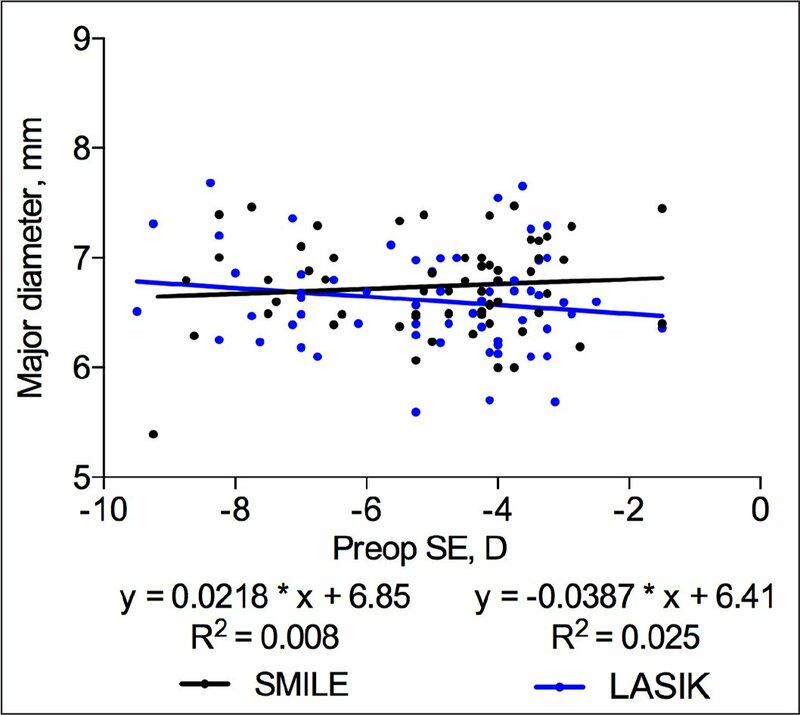 Postoperative increase in spherical aberration was lower in SMILE than in LASIK (0.08 ± 0.16 vs 0.17 ± 0.18 µm, P = .002). The FOZ area was significantly larger in SMILE than in LASIK (30.25 ± 3.60 vs 29.21 ± 3.72 mm2), despite the smaller programmed OZ diameter (6.48 ± 0.08 vs 6.52 ± 0.11 mm) and smaller programmed treatment area (33.87 ± 0.81 vs 46.30 ± 2.61 mm2, P < .037). Pupil centration (0.43 ± 0.21 vs 0.41 ± 0.22 mm) and apex centration (0.48 ± 0.24 vs 0.48 ± 0.22 mm) were comparable between SMILE and LASIK (P > .694). SMILE created a larger FOZ than LASIK, despite the smaller programmed OZ. This may be due to a difference in the biomechanical response between the two procedures. Visual outcome and centration were comparable between SMILE and LASIK. Small incision lenticule extraction (SMILE) has become an alternative to femtosecond laser–assisted in situ keratomileusis (LASIK) as a surgical treatment for myopia and myopic astigmatism.1 SMILE relies on the patient fixating on a green light while the surgeon centers the low suction system and the eye will not move relative to the laser once suction is engaged.2 This is in contrast to commonly used excimer lasers in LASIK, where there is a risk of fixation fatigue during excimer ablation. The excimer lasers in LASIK use an integrated eye-tracker alignment system that adjusts for fixation fatigue and involuntary movements during ablation.2 The eye-tracking system reduces the risk of severe decentration and is less dependent on patient cooperation.3 However, the eye-tracking system does not completely eliminate the risk of decentration after LASIK.4 Decentration of the laser treatment in both SMILE and LASIK increases the amount of postoperative coma,5 and may cause visual complaints such as halos and monocular diplopia.6 It has been questioned whether there is a difference between the fixation-based centration in SMILE and the eye-tracker–based centration in LASIK. Previous studies2,7 have been limited by the analysis of matched patient groups; hence individual patient responses may affect outcomes. The concept of an effective OZ12 or functional optical zone (FOZ) was introduced to evaluate postoperative modification of the OZ and describe the area that achieves the intended optimal correction after surgery.13 Previous methods to assess the FOZ include region-growing algorithms,3,14 ray-tracing analysis,13,15,16 and corneal power distribution analysis.17 In ray-tracing analysis, the FOZ is defined as the aperture diameter that produces a potential visual acuity of 20/32.13,15,16 In corneal power distribution analysis, the FOZ is defined as the ring corresponding to a zone diameter from 1 to 8 mm, centered on the pupil, with a difference of 1.50 D or less between the mean ring power and the pupil center power.17 One major limitation of both techniques is the assumption of a circular area with optimal correction, but the FOZ may not have a circular form.13 Thus, one-dimension measurements of the FOZ diameter may be less accurate than a calculation of the area with optimal correction. A region-growing algorithm can be used to assess the area of a non-circular FOZ, as seen in previous studies.3,14 This technique outlines the area bounded by the mean refractive power of the seed area plus 1.33 times the standard deviation of the refractive power of all corneal data in the refractive power map. For postoperative measurements, the seed area is defined as the 3-mm circular zone with the lowest mean refractive power. The region is not constrained to be circular, and it grows outward from this seed area until the stated criterion is met. This was a prospective, randomized, single-masked, paired-eye study design, with enrollment of 70 patients between May 2012 and November 2016 at Singapore National Eye Center. Details of inclusion criteria have been described previously.20 Patients were randomized to receive SMILE in one eye and LASIK in the other eye by a computer-generated random allocation sequence. Patients and their caregivers were masked for the allocation of SMILE and LASIK. Preoperative and postoperative examination included uncorrected distance visual acuity (UDVA) and corrected distance visual acuity (CDVA), manifest refraction, slit-lamp biomicroscopy, and dilated fundus examination. Corneal tomography was acquired preoperatively and 3 months after surgery (Pentacam HR; Oculus Optikgeräte GmbH, Wetzlar, Germany) and the change in corneal spherical aberration was evaluated for pupil sizes of 6 mm. The study was approved by the institutional review board (Singhealth) and registered at www.clinicaltrials.org before enrollment (No. NCT01216475). The study was conducted in agreement with the tenets of the Declaration of Helsinki, and all participants were thoroughly informed before written consent was obtained. SMILE and LASIK were performed sequentially on the same day under topical anesthesia by one experienced surgeon (JSM). For LASIK, the flap was created using the Visumax 500-kHz femtosecond laser. Laser energy index was 140 to 170 nJ with a spot/tracking distance ranging from 4.2 to 4.8 µm (lamellar) and 1.5 to 2.0 µm (side cut). The intended flap thickness was 120 µm and flap diameter was 7.9 mm with a superior hinge position. Centration of the excimer ablation with the WaveLight EX500 excimer laser (Alcon Laboratories, Inc., Fort Worth, TX) was initiated by first asking the patient to fixate on the four yellow lights and then on the green fixation light. The ablation profile was focused to be centered on the point of fixation.21 Excimer ablation was subsequently done with a 6.3- to 7-mm optical zone. The transition zone was set to 0.30 mm for spherical corrections and 1.25 mm for cylindrical corrections. For SMILE, the procedure was performed with the Visumax laser, as described previously.22 The angle kappa intercept (where the visual axis intercepts the corneal anterior surface) was evaluated on topography. The patient was then asked to focus on the fixation light before initiation of docking and suction. The position of the fixation was assessed compared to the preoperative topography. For patients with more than 0.6 mm angle kappa intercept, centration was adjusted prior to docking to be within 0.5 mm of the coaxially sighted corneal light reflex, evaluated by the measuring rings in the operating microscope.23 The energy index was 145 to 185 nJ with a spot/tracking distance between 3 and 4.5 µm for the cap and 2 µm for the side cut. Intended cap thickness was 120 µm and cap diameter was 7.5 mm. At 120° position, a 3-mm incision was created to extract the lenticule. The lenticule diameter was between 6 and 6.5 mm with a transition zone of 0.1 mm for cylindrical corrections and a minimum lenticule thickness of 15 µm. Remaining tissue bridges were gently removed with a SMILE dissector (AE2403; Asico, LLC, Westmont, IL), and the lenticule was removed with a pair of forceps. For both eyes, the postoperative regimen included one drop of 0.1% dexamethasone (Maxidex; Alcon Laboratories, Inc.) and moxifloxacin (Vigamox; Alcon Laboratories, Inc.) four times a day for 2 weeks. 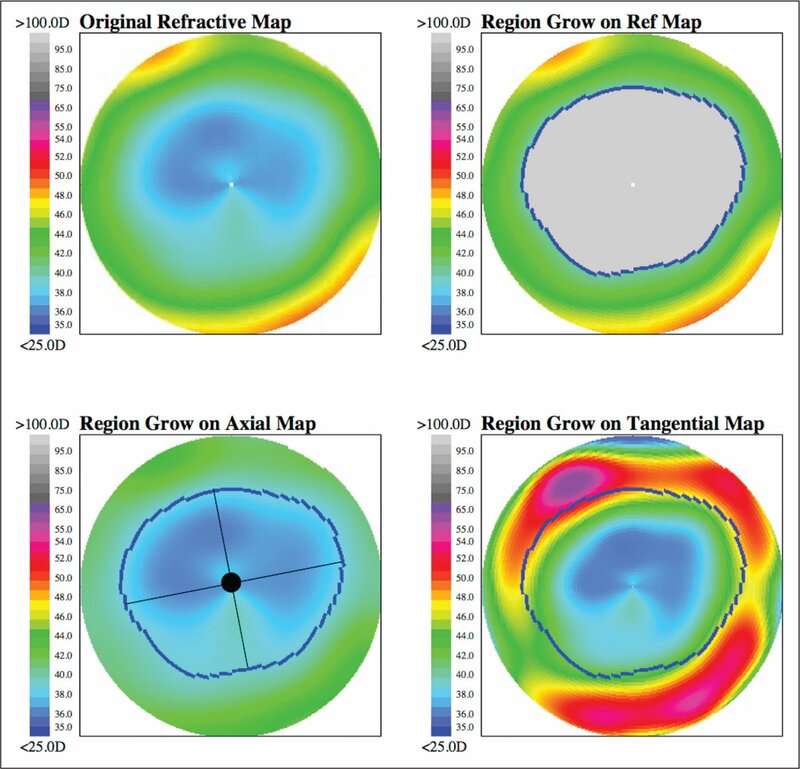 Custom software from The Ohio State University Corneal Topography Tool was used to assess the FOZ and decentration, based on a region-growing algorithm from a Bayesian classifier.14 Refractive power maps using Snell's law were exported from the postoperative Pentacam data. 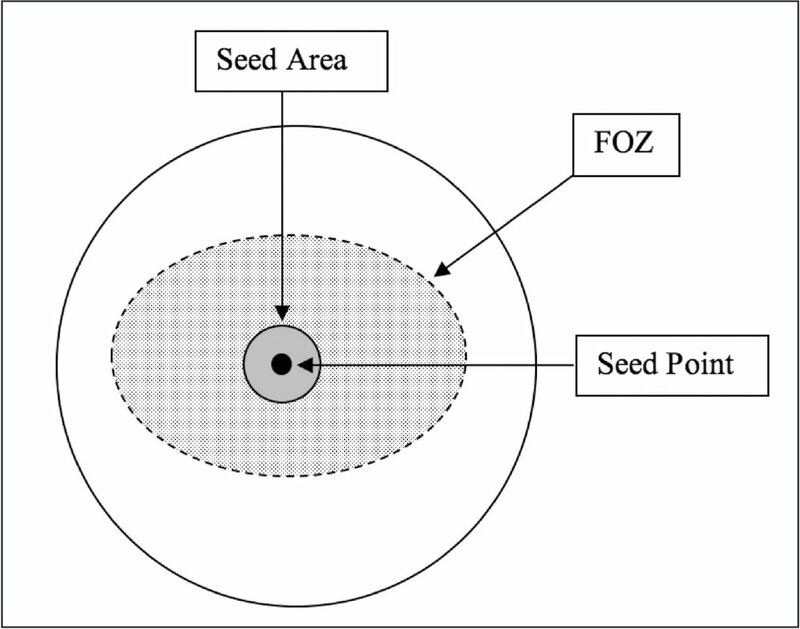 The FOZ area was determined in three steps (Figure A, available in the online version of this article): (1) the seed area was located using a customized algorithm that searched the map to identify the 3-mm circular zone with the lowest mean refractive power for the postoperative measurements; (2) the mean refractive power (mean_seed) was calculated for the seed area together with the standard deviation for all corneal data in the map (SD_cornea); and (3) the region-growing algorithm constructed from a Bayesian classifier was applied to establish the limits of the FOZ area. From the seed point, each neighboring point was checked to determine if it was within the threshold of mean_seed ± 1.33 × SD_cornea. If so, the point would be included in the FOZ area, and the process repeated for the neighboring points until termination (above or below mean_seed ± 1.33 × SD_cornea). The FOZ outer limit was marked when the expansion of the area was terminated in all directions, and the length of the major and minor FOZ diameters were determined (Figure B, lower left, available in the online version of this article). Estimation of the functional optical zone (FOZ). The seed area (dark gray) was the 3-mm region with the lowest average refractive power within the central 5-mm radius of the cornea. The mean refractive power from the seed area was used to locate the outer limit of the FOZ (dotted line) by a region-growing algorithm (see methods). The programmed treatment zone was given by the sum of the programmed OZ and the transition zone. The programmed treatment area was calculated as the circular area with a diameter corresponding to the programmed treatment zone. The programmed OZ area was calculated from the OZ diameter as π × (programmed OZ diameter / 2),2 not taking into account the transition zone. The ratio of FOZ area/programmed treatment area was then calculated together with the ratio of FOZ area/programmed OZ area. Decentration was calculated as the linear distance between the FOZ centroid and the pupil center using the distance formula. The FOZ centroid was positioned at the crossing of the minor and major axis and the pupil center coordinates were acquired from the Pentacam. Because the Pentacam centers on the corneal apex during alignment, the linear distance between the FOZ centroid and the apex at the center of the refractive power map was also calculated to evaluate centration relative to the corneal apex. Statistical analysis was performed in SAS software (version 9.4; SAS Inc., Cary, NC), using the Student's paired t test and Wilcoxon signed-rank test for continuous variables and chi-square for categorical variables. Spearman's correlation test was used to assess the correlation between the spherical equivalent and the FOZ. A P value of less than .05 was considered to indicate statistical significance. Preoperative and postoperative refractive correction and visual acuity are reported in Tables 1–2. A total of 60 patients (87%) had complete datasets with good quality scans at both time points and from both eyes. Suction loss occurred in one patient during the anterior interface cut in SMILE, but the laser was immediately redocked and the surgical procedure completed. One patient had suction loss during LASIK during the side cut. Surgery was rescheduled 10 days later where the side cut was successfully completed. Both patients had a UDVA of 20/20 at the 3-month follow-up visit. The average increase in spherical aberration was significantly higher in LASIK than in SMILE at 3 months (P = .002, Table 2). Mean values and standard deviations related to the FOZ are summarized in Table 3 and Figure 1. The average programmed OZ diameter (P = .021) and programmed OZ area (P = .031) were significantly larger in LASIK than in SMILE (Table 3). Likewise, the programmed treatment zone diameter was significantly larger in LASIK (7.68 ± 0.23 mm) than in SMILE (6.57 ± 0.09 mm, P < .001), due to the compulsory larger transition zone in LASIK for myopic astigmatism. Despite the significantly smaller programmed treatment zone in SMILE, the mean FOZ area was larger at 30.25 ± 3.60 mm2 in SMILE compared with 29.21 ± 3.72 mm2 in LASIK (P = .036). 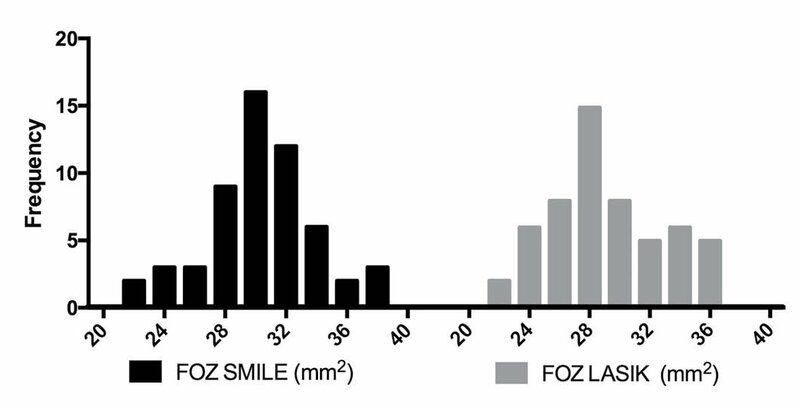 Similarly, the major FOZ diameter was larger in SMILE than in LASIK at 6.73 ± 0.42 and 6.60 ± 0.45 mm, respectively (P = .033, Table 3). The ratio of FOZ/programmed OZ area was 0.92 ± 0.11 and 0.88 ± 0.11 mm2 for SMILE- and LASIK-treated eyes, respectively. No correlation was found between the major FOZ diameter and the preoperative SE (P > .678, Figure 2). 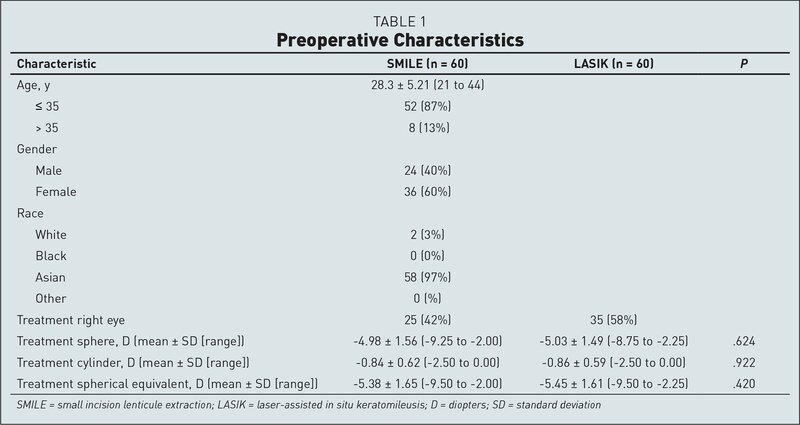 Distribution of the functional optical zone (FOZ) in small incision lenticule extraction (SMILE) and laser-assisted in situ keratomileusis (LASIK) for patients treated with a programmed optical zone of 6.5 mm. Decentration relative to the pupil center was evaluated in 59 patients, due to one missing central pupil coordinate in a LASIK-treated eye. Decentration relative to the corneal pupil center and corneal apex were similar between SMILE- and LASIK-treated eyes (P = .695 and .910, Table 3). The number of eyes with decentration more than 0.5 mm from the corneal apex and pupil center did not differ between LASIK and SMILE (P = .684 and .870, chi-square test, Figure 3). 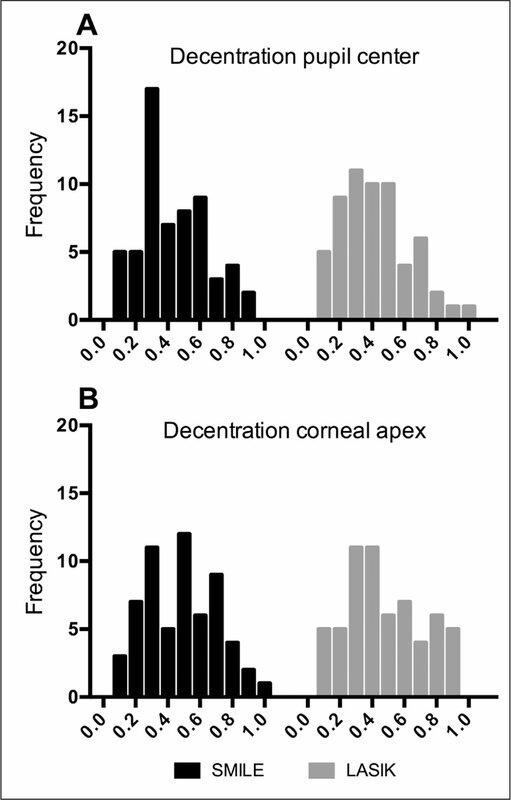 Distribution of decentration from (A) the pupil center and (B) the corneal apex in small incision lenticule extraction (SMILE) and laser-assisted in situ keratomileusis (LASIK). In this randomized controlled trial, we observed a larger postoperative FOZ in SMILE than in LASIK, despite the average programmed OZ, treatment zone, and treatment area being significantly smaller in SMILE. Centration was similar between SMILE and LASIK. A notable strength of our study was the paired-eye approach that takes into account the variability in corneal biomechanical properties among individual patients. Previous studies of SMILE have used intraoperative video capture images combined with preoperative topography to assess centration and found a mean decentration of 0.13 to 0.17 mm from the pupil center and 0.19 mm from the corneal vertex.23,29 Another study used preoperative and postoperative front elevation maps to determine the center of the optical zone and found a mean decentration of 0.17 ± 0.09 mm from the cornea apex.30 However, the use of an elevation map is not valid to find the center of the OZ or calculate FOZ. This is a relative map comparing the cornea to the best fit sphere. The location and size of the central area below the sphere depends on fitting protocols including size of the circular region of fit, and not how the treatment was centered. Comparative studies of SMILE and LASIK using difference pachymetry and tangential curvature maps have found a mean decentration from corneal vertex of 0.20 to 0.32 mm in SMILE and 0.17 to 0.52 mm in LASIK.2,7 However, pachymetry difference maps may lead to incorrect estimation of centration because the anterior corneal curvature is altered after laser refractive surgery, and thus alignment of the normal distance from the anterior surface is also altered.31,32 Furthermore, studies of comparative groups are sensitive to the variability in fixation among individual patients, which could bias results. In the current study, we did not center the treatment over the corneal apex. This must be taken into consideration when comparing with previous studies evaluating centration following SMILE and LASIK. We chose to use a region-growing algorithm to examine FOZ because it automatically calculates the area of the FOZ from the postoperative refractive power maps. The ray-tracing method targets the optical performance rather than the surface shape of curvature maps, and the power distribution method relies on manual measurements of the FOZ. The region-growing algorithm for FOZ calculation has previously been used in LASIK for comparison of myopic and hyperopic astigmatism.14 The authors reported a mean postoperative FOZ of 30.94 ± 5.43 mm2 for the myopic group (OZ of 6.5 mm), which was similar to the 29.21 ± 3.72 mm2 we found after LASIK. No studies have used a region-growing algorithm to examine the FOZ following SMILE. A previous study used power distribution maps to evaluate SMILE and found similar FOZ diameters in comparative groups with an OZ of 6.5 mm (FOZ: 5.09 ± 0.83 mm) and 6.2 mm (FOZ: 4.64 ± 1.16 mm).17 However, the authors did not report the actual area of the FOZ, which may be more important for functional outcomes than linear measurements. The fact that LASIK-treated eyes on average had the largest programmed OZ but still produced a smaller FOZ may not seem intuitive. However, Dupps and Roberts10 demonstrated on intact donor eyes how an acute biomechanical expansion of peripheral stromal matrix alters the corneal topography after anterior collagen lamellar disruption and loss of tension. As a consequence, the peripheral part of the collagen tends to relax toward the limbal base, causing a central hyperopic shift. The peripheral response may decrease the area of optimal correction, measured as the FOZ. In theory, the biomechanical alterations in the peripheral area of the cornea would be less after SMILE than LASIK because the anterior collagen fibers are more intact in the former, except for the arcuate incision.33 Hence, we would expect a different biomechanical response in the peripheral part of the cornea, compared to what is seen after LASIK, in the characteristic red ring on the postoperative tangential topography maps.34 This clinical study supports the experimental theory, with a significantly larger FOZ in SMILE despite an average larger programmed OZ and treatment zone in LASIK. A limitation to this study was the single-masked design where the operating surgeons were aware of the allocated treatment in each eye. However, the assisting personnel (nurses, optometrists, and research assistants) were masked to improve the objectivity of the study. Also, the FOZ and centration analysis was done independently by two researchers not affiliated with the study location. The treatment area for astigmatic corrections in LASIK was calculated as a circular area, although the transition zone is nonuniform and dependent on the amount of astigmatism treated. However, if the transition zone was set to 0.4 mm, corresponding to the transition zone for spherical corrections, the ratio of FOZ area/programmed treatment area would still be significantly larger in SMILE than in LASIK. We used the pupil coordinates from the Pentacam to evaluate centration, but the pupil coordinates are dependent on the pupillary hippus. This affects the repeatability and precision of the pupil coordinates and must be taken into consideration when interpreting the centration following LASIK and SMILE.35,36 Our evaluation of FOZ was limited to a comparison of the two-dimensional treatment zone, but did not include the actual amount of removed tissue. Also, using a region-growing algorithm to access the biomechanical response did not allow us to distinguish between the effect caused by alterations in the stromal tension and the epithelial rearrangement over time. We chose to evaluate the FOZ 3 months after surgery because the biomechanical repose after tissue removal had stabilized. Further research may explore and combine the FOZ with the in vivo corneal biomechanical properties after LASIK and SMILE to better understand the biomechanical alterations after laser refractive surgery. This prospective, randomized, paired-eyed study demonstrated a larger FOZ after SMILE than after LASIK, despite a larger programmed OZ in LASIK. The accuracy of centration was similar between fixation-based SMILE and eye-tracker–based LASIK. Bühren J, Yoon G, Kenner S, MacRae S. The effect of optical zone decentration on lower- and higher-order aberrations after photorefractive keratectomy in a cat model. Invest Ophthalmol Vis Sci. 2010;48:1–22. Roberts CW, Koester CJ. Optical zone diameters for photorefractive corneal surgery. Invest Ophthalmol Vis Sci. 1993;34:2275–2281. Dupps WJ, Roberts C. Effect of acute biomechanical changes on corneal curvature after photokeratectomy. J Refract Surg. 2001;17:658–669. Han DC, Chen J, Htoon HM, Tan DT, Mehta J. Comparison of outcomes of conventional WaveLight® Allegretto Wave® and Technolas® excimer lasers in myopic laser in situ keratomileusis. Clin Ophthalmol. 2012;6:1159. Zhang J, Zhang SS, Yu Q, Lian JC. Comparison of visual effects of FS-LASIK for myopia centered on the coaxially sighted corneal light reflex or the line of sight. Int J Ophthalmol. 2017;10:624–631. Roberts CJ. The cornea is not a piece of plastic. J Refract Surg. 2000;16:407–413. From the Department of Ophthalmology, Aarhus University Hospital, Aarhus, Denmark (IBD); Singapore Eye Research Institute, Singapore (IBD, MA, MF, JSM); Singapore National Eye Center, Singapore (MA, MF, JSM); the Department of Clinical Sciences, Duke-NUS Graduate Medical School, Singapore (MA, JSM); the School of Material Science & Engineering and School of Mechanical and Aerospace Engineering, Nanyang Technological University, Singapore (JSM); the Departments of Biomedical Engineering and Ophthalmology & Visual Science, The Ohio State University, Columbus, Ohio (AMM, CJR). Dr. Roberts is a consultant for Oculus Optikgeräte GmbH and Ziemer Ophthalmic Systems AG, is on the Advisory Board of and is a consultant to Optimeyes, and has received research funding from Carl Zeiss Meditec. Dr. Mehta is a consultant for Ziemer and Carl Zeiss Meditec. The remaining authors have no financial or proprietary interest in the materials presented herein.